New web site offers panoramic photo gallery, travel planning tools, and multi-sensory online experience all-in-one. The Lugano Tourist Office announces the launch of http://www.discoverlugano.ch, the new multi-sensory website designed to immerse visitors in the culture, sights, and sounds of Southern Switzerland's Lugano Region. It's a must-visit website for travelers and anyone interested in learning more about this popular European destination. A series of breathtaking panoramic photos combined with realistic-sounding audio bring this destination to life. A growing trend in the travel industry, new interactive technology is taking virtual travel experiences to new levels. Whether delivered via podcast, video, audio file or photo gallery, today's online travelers and travel planners don't just view information, they immerse themselves in it. Discover Lugano is the first-of-its-kind online travel photo gallery dedicated to this part of the world. "Our immersive panoramic photo website offers visitors a unique and engaging format plus an impressive introduction to the Lugano Region. The stunning picture quality image files and crisp audio files literally take you there," says Marco Sorgesa, Director at the Lugano Tourism Office. "With regular pictures, it's easy to lose perspective on something as vast as the Swiss Alps. Panoramic landscape images add depth and dimension and a whole new perspective," adds Marco Sorgesa. While striving to create a fun and informative online experience, Discover Lugano is much more. It is also a feature-rich travel planning tool focused solely on the lakes, mountains, shops, nightlife, and dining spots found in this vibrant city with a small town feel. 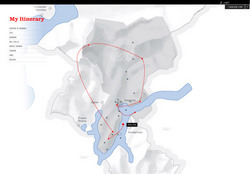 Discover Lugano users can map points of interest and add points of interest onto itineraries. They can even download and email finalized itineraries to themselves, friends and relatives. Parco San Grato, Monte Bre, the city and its Casino, the lakes and valleys of Lugano - all the regional points of interest are there. Links to nearby accommodations, shopping, dining, and activities make planning a trip to the cultural and historic Lugano Region easy. Anyone interested in a memorable online travel immersion experience can visit http://www.discoverlugano.ch . It has all of the sights and sounds of the Lugano Region plus useful travel planning tools.